Looking to spend some time in San Miguel? 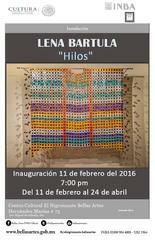 HUIPILES / HOMENAJES is a tribute in huipils, to women who have inspired me, weavers of the traditional huipils, and an acknowlegment of the inspiration they have given me over the many years I've been doing this work. At the Hotel Casa Santo Domingo, July 5 - August 3, Antigua, Guatemala, 2014. Jul. 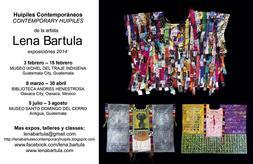 5 - Aug. 3, Santo Domingo, Antigua, Guate. 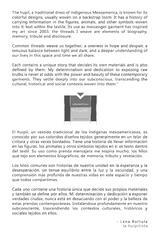 All three exhibitions will have the same title, HUIPILES CONTEMPORANEOS, and all will have some of the same works depending on the space variations. Each venue will allow for at least one installation, which will be done on-site according to materials available. Alma del Cartón opened at El Museo de la Esquina on March 1, to a large and welcoming crowd. 12 artists, for a total of 36 dolls, and all were uniquely stunning. Happy and honored to be included in a group of women artists: Marisa Boullosa, Mariló Carral, Sylvia Ordoñez, Delia Pérez Salina, Estela Hussong, Soledad Tafoya, Vanessa Salas, Ana Maria Montes de Oca Georgina Quintna, Trini and Betsabé Romero. 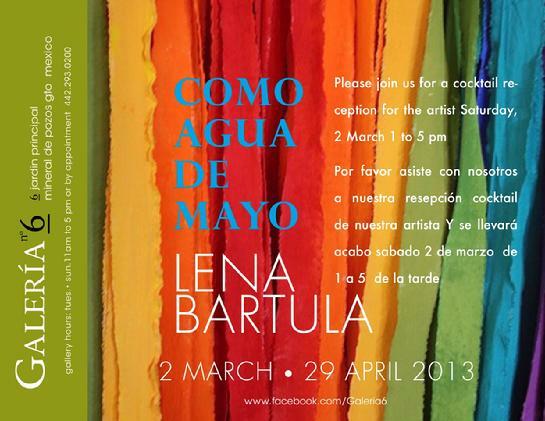 LENA BARTULA STUDIO is located in San Miguel, and is open by appointment only. Colonia Guadalupe, at Carlos del Castillo 12A. Works are available on this site as well as through the galleries listed below. Email me if you need more information, or if you're headed this way and want to make contact. 2011 was a long year, a year without artmaking, without time to even think about art. Except for the art that I was teaching and making with the women in the ranchos. My studio was eerily empty of action, as if a ghost lived there. But no more! 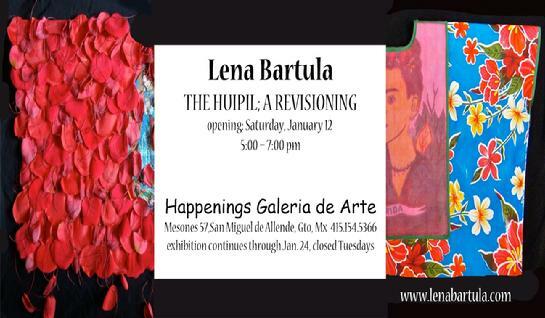 I officially ended my sabbatical in February, 2012, at a dinner for artists who are invited to show at el Museo La Esquina, the new toy museum here in San Miguel. 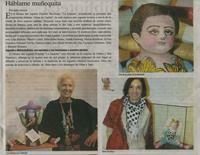 Each of 12 artists were given 3 dolls for the museum, which will host the exhibition in February, 2013. 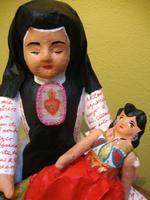 Right: one of the dolls completed, Mi Divina Lysi. Sor Juana Inés de la Cruz, one of my long-standing muses, holding her Divine Lysi in a pose reminiscent of Frida Kahlo holding her true love, Diego. The other two dolls also became Sor Juanas, in different aspects of her personality. On January 1, 2011, I began an art sabbatical. Well, maybe that's not it exactly. I am taking a sabbatical from making art. With the cancellation of the show at Bellas Artes, the downturn in the economy, and the increased interest and workload in the Mariposas project, it was just time to take a break. For now, I have committed to focusing on the project, www.mariposassanmiguel.com The energy and the magic seem to be in working with these wonderful women around San Miguel, as you'll see if you click on the link above. The river is flowing whether I am with it or not, so I'm going with it. However, I am not on sabbatical from sellng art, teaching or exhibiting, and I look forward to staying in touch with artists, art lovers, collectors and curators. Who knows what might come of a change like this? I've been making art for 35 years now, so IT'S ALL NEW. But IT'S ALL GOOD. I have sold off most of my "studio" and art collection, so as to begin fresh with lots of space for the Mariposas products. Sale to the public began on April 14. And yes, I can ship from Mexico, so please have a look at the work on this site and email me if I can send you a new piece of art for your collection. Galeria 6, Mineral de Pozos, Gto. My painting, "Sword Trees Remind Me of Kali" graces the cover of this classical c.d. 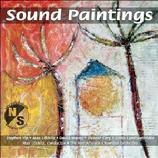 by various artists at North/South Recordings in New York. "Included in this album are five vibrant works by living American composers, recorded for the first time. Without a doubt, the listener will be pleasantly surprised by the diversity and inventiveness found in this anthology." July offers three opportunities to see my work in three different venues. What a busy month! 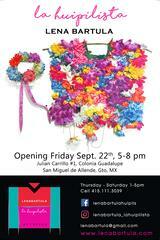 Thursday, July 8: book-signing / release party / exhibition for "ARTE EN SAN MIGUEL II" by Al Tirado. You're all invited, and I look forward to seeing you at one or more of these grand celebrations! Finally, the finished version of the catalog from last year's exhibition, MENSAJES GUARDADOS, is available for sale, and we are all so proud of it. 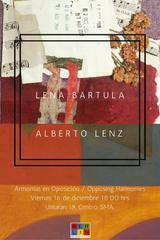 Your copy can be purchased at Galeria 6 in Mineral de Pozos, or from me at Lena Bartula Studio in San Miguel. Or by mail, if you email me here. Very comprehensive, full color photos, 39 pages, poetry, bilingual introduction by Collette Sell, commentary by Marcelo Leos. Design by Denis Duncan.